For the past week, Sydney residents gathered in Martin Place to participate in a 24/7 forum to discuss creating futures that are more inclusive, just and sustainable. In the heart of the city, Martin Place is wide enough to host hundreds of people while accommodating passers by. This patch of Sydney, squeezed between the corporate foyers of the Reserve and Westpac banks, is an otherwise under-utilised resource. Were the people that gathered peaceful and inclusive? Yes, and they were kind and generous, too. Personally, I found the way the space was organised colourful, welcoming and cushy (sleeping bags abound), if untidy… but in a city dotted with deep craters surrounded by trucks, cranes and pollution, a few sleeping bags and hand-made signs was hardly an affront to Sydney’s visual amenity. The proprietors of the local coffee cart couldn’t believe their luck, and started a late night service to feed hungry visitors to the site. An employee of a chocolate shop down the road enthused that visitors have been “stock[ing] up on chocolate and coffee”. Of the five closest food retailers, I’d be surprised if one of them didn’t see an upturn in sales as a result of this dead city space becoming a hive of activity. 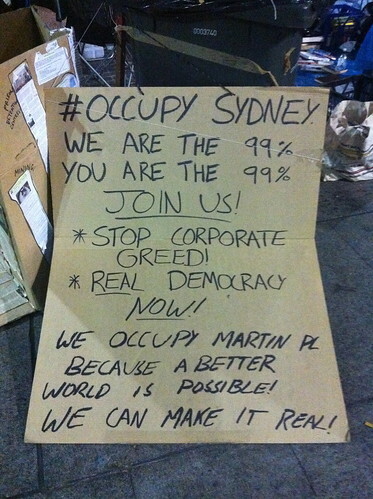 Didn’t the #occupy movement start in Wall Street? This isn’t America! 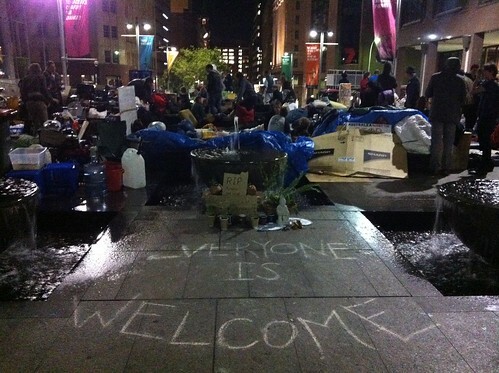 At the time of writing, more than 1500 cities are hosting #occupy gatherings. ‘Wall St’ influence, excesses and gambles are shaping the lives of people in multiple ways. Many of the same questions about fairness, equity and sustainability Americans are asking ought to be addressed here, too. Australians have their own grievances, concerns, hopes and dreams and many would like to advocate, discuss and debate these in an inclusive, open forum. So who shows up to this stuff? 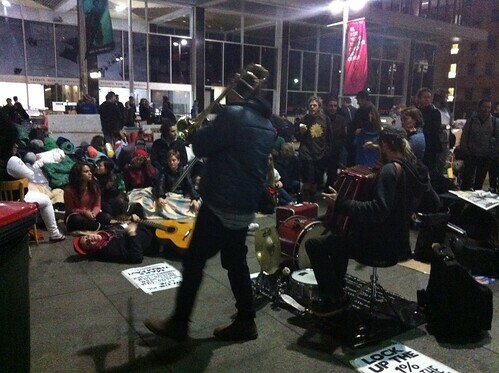 The Australian #occupy spaces were given far more mainstream media coverage than your average Friday night “Politics in the Pub”… So with a nudge like that, it wasn’t just the ‘usual suspects’ that showed up. Participants have come from a mix of backgrounds and experiences. While we didn’t often talk about our backgrounds, in my conversations at #OccupySydney I spoke with carers, lawyers, bankers, wharfies, engineers, homeless, contractors, jobless, university students, teachers, marketers and scientists… People from all walks of life had come for a multitude of reasons. Politically, there were people who consider themselves swinging voters, others were a-political. There were capitalists, greenies, anarchists, socialists and conspiracy theorists, and each treated the others with respect and humanity. In our complex world, expecting people to come together with a single grievance or solution is unrealistic. It’s in the coming together, the conversations, the dialogue, that common ground is found. So why gather at all? Sydney has plenty of places where you can eat, drink, take drugs to loud music, gamble money on sport or in machines, and buy stuff. There are plenty of places where you can have a picnic, read a book, have a swim or go for a walk. But public spaces where people are welcome to gather with fellow citizens, 24/7 to talk about addressing systemic problems and find ways to organise to build better futures? Well, that hasn’t really happened before. In a functioning democracy, with shift-workers pulling nights and contractors slogging it out during the days, gathering during a fixed window of time isn’t an inclusive approach. The web has influenced our “’round the clock” world where we connect electronically with whoever’s awake; if anything, this lifestyle shift has given rise to the acceptability and practical necessity of a public space for 24/7 political conversations. 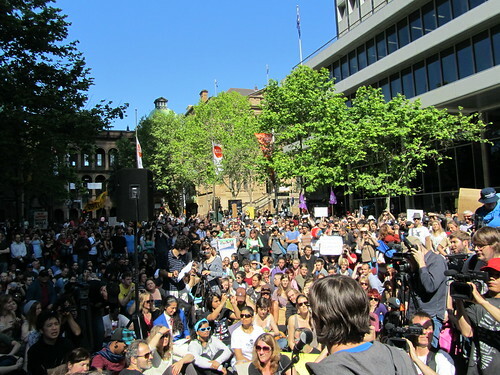 “We have the power to begin the world over” – the sleeping bags of a selection of Sydney’s idealists in the foreground as a General Assembly takes place (background). A General Assembly (meeting)takes place on Monday night. You can read more about these in my original Occupy Sydney blog post. 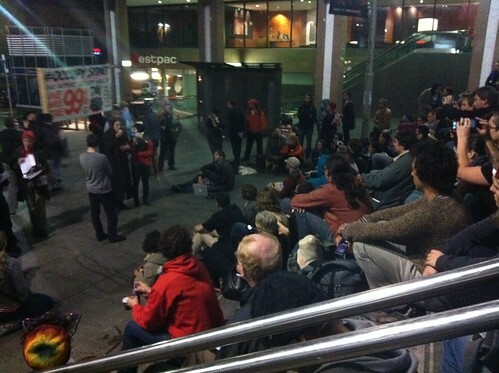 This one took place on the amphitheatre steps… Because a few of Sydney’s homeless people use these steps to eat their dinner, it was agreed the General Assemblies would happen away from the comfort of the steps to ensure #OccupySydney participants weren’t breaking the homeless peoples’ routine. 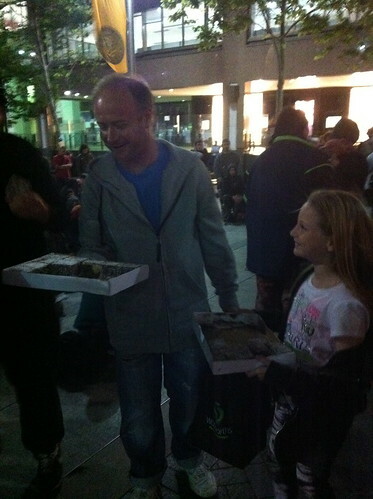 “We can’t camp out with you, but we support what you’re doing…” A dad and daughter bring lamingtons to Occupy Sydney. The lamingtons were well received, as were the pizzas, salads, crackers, biscuits… much of the food was donated by people supportive of this democratic process. 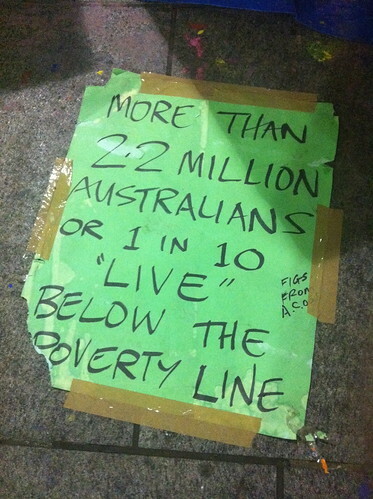 “More than 2.2 million Australians live below the poverty line” – one of the many hand-made posters inviting passers-by to consider the world from another point of view. In a city filled with luxury handbag shops and ads for TV shows and yogurt, why not inspire people to reflect, think or act, rather than just consume? “Discussion in progress, please join”… One of the many signs that made it clear to all citizens that this space was for everyone. For a city where many bars and clubs will happily exclude people based on age, race, gender or dress, this was refreshingly inclusive. And no cover charge. This band rocked. I asked them who they were and when they were playing their next gig, and they said they’d prefer not to plug their next gig because it was more important that people focused their attention on keeping Martin Place vibrant. Another of the many hand made signs. None of the signs could truly capture the sentiment or feelings of the thousands who participated in the first week, but the positivity of, “We Occupy Martin Place because another world is possible!” does a pretty good job. “Everyone is welcome” the pink flag to the left (obscured) reads, “What if we were prepared to sacrifice our comfort for change?”. The banner is part of a city-wide art exhibition. The serendipity of its placement reassured many of those sleeping under street lights. Throughout the week, the ever-present police were hanging around talking to each other and mostly looking bored. They had joined the force to catch bad guys, and now they were stuck here watching people discuss massive corporate crimes that were well outside their jurisdiction… Must have been frustrating for them. Occasionally they’d read a poster or engage in a brief conversation about political ideas. 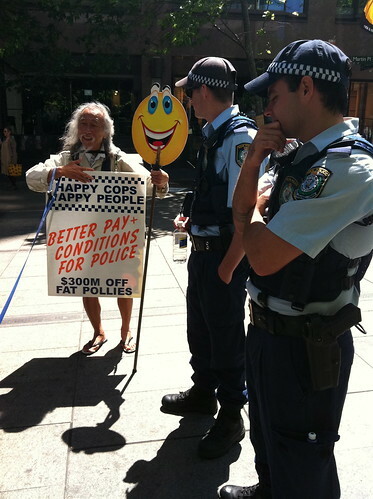 I spoke to police every time I visited Occupy Sydney, and not once did they advise me that I was participating in an activity that was “in breach of the city’s camping regulations”. They sure didn’t manage to warn anyone that because people were sacrificing their comfort for something they believed in, riot police and bomb squad personnel would soon be deployed. Danny (pictured, above) recognised the ever-present risk of violence, and made himself a billboard to advocate for police pay and conditions. He is a true lover of peace and happiness. Every city could do with a few of him. If you ever see him, say G’day to him, and pat his dog, Smarty. 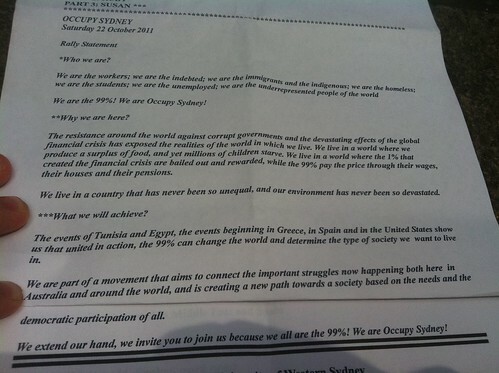 The Occupy Sydney statement that was created through consensus by the participants of Occupy Sydney on Friday. The riot police showed up on the Saturday rally that celebrated one week. 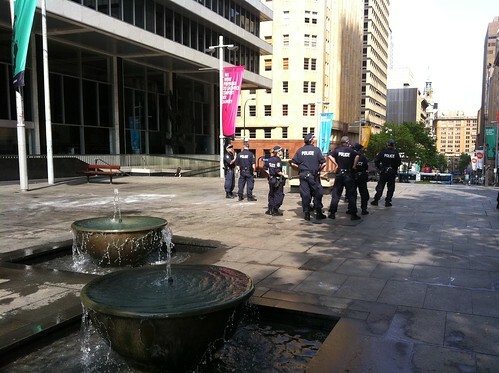 The police “kettled” the protest by lining the only two exits out of Occupy Sydney. There had been plans for some participants on Saturday to leave the space and do a tour of Sydney, highlighting some of the misdeeds of various corporations who occupy the city buildings. Through a democratic process, it was agreed that the police presence meant it would not be appropriate to embark on the tour. Such a tour would have involved the crowd confronting two lines of riot police. A walk would risk violence, and as a peaceful democratic movement, we agreed the tour would instead take place in small groups later in the week. And so the people stayed. They stayed and played music, talked, shared political ideas, and handed leaflets with cartoons and jokes on them. They stayed and ate sausages on bread rolls. It was a laid-back picnic protest. It wasn’t what a few of the gung-ho activist types would have liked (they rightly argued that the riot police showing up was intimidating and unnecessary, and if citizens had to cross a line of riot police to go for a walk on public streets, than so be it)…But it was a global movement expressed with an Australian flavour… Many of us weren’t rusted on activists… We were simply participating in a democratic action. The presence of riot police was more bemusing than anything. We weren’t doing anything that would call for riot police! This isn’t a police state, after all. This morning I woke to the news that the riot police moved in at 5am. I’ve read reports that those who were asleep were woken and given 5 minutes to vacate the space. Tired, indignant, sleepy, angry… Some participants decided that their peaceful protest, a statement aimed in part at strengthening democracy, didn’t deserve the riot squad, and chose to stand their ground. An hour before daybreak, away from the transparency and accountability of sunlight and cameras, the police pounced. They destroyed the signs that quoted statistics about poverty and pollution, and the people were dragged away. A number were arrested. The space was cleared of both character and civility. The area between the Reserve and Westpac banks was made plain, boring and uninviting again. Pictured: In this exact spot, every hour for a week, conversations about peace took place. Today, storm troopers with guns and tasers instead took pride of place. I wonder what refreshing ideas were discussed here today? NSW Police Assistant Commissioner Mark Murdoch explained it was time “to return Martin Place to the community of Sydney.”. The community of Sydney already had the space, thanks Mark. No matter how hard you scrub, the ideas that were discussed here, the connections that were sparked, remain. 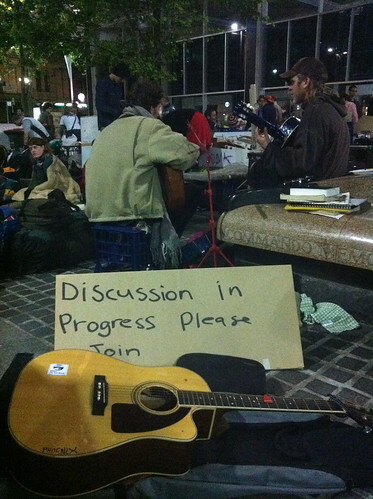 Outside the Reserve Bank in Sydney’s Martin Place, at 8.30pm last night, participants of #OccupySydney were organised. As if the architects of the city had planned it this way, a row of steps just outside the bank make for a natural amphitheatre. In that space, an engaging, entertaining meeting between 150 Sydney-siders was taking place. This meeting was almost certainly more participatory and engaging than the meetings usually held in the skyscrapers here in Sydney’s financial district. The group are inspired by #OWS or Occupy Wall Street, a citizen movement that began 4 weeks ago in New York and has spread to cities around the world. Yesterday was Day 3, and much of the conversation was about how to make sure Sydney’s residents feel welcome and included in this public space: a space decorated by signs and constructed not of fixtures and fittings, but milk-crates and sleeping bags. (‘Permanent’ structures, like tents, have already been confiscated by police). As a speaker speaks, the audience participate by using their hands to communicate with each other and the speaker. Imagine speaking to 150 people, and having them offering instant feedback; like a television ‘worm’ during an election debate. There’s “I agree” (palms up, wiggling fingers), “I disagree” (palms down, wiggling fingers), “I object strongly and want to speak” (forearms crossed in front of face) and “wrap it up, this is taking too long” (forearms rolling in front of each other). These protocols proved very effective for the hour I was there, allowing instant votes to be held on matters of procedure, consistently seeking and achieving consensus. Not everyone would be sleeping there tonight, but some would choose to… 24/7, people are welcome join in: to ask questions, to debate, and to imagine futures for their city, their country and the world. If you’re wondering what the participants stand for, well, a few themes have emerged: equity, sustainability and democracy. On the economy, to quote business writer Alan Kohler, “while [most people’s] wages are going nowhere, being cut, or disappearing as jobs are lost, CEOs are still making ever more money”. The expression, “We are the 99%” has become a rallying cry of some participants, who are telling their personal stories via the web. On the environment, we know climate change is real, and many signals – from our air and water quality to species extinction – indicate that we need to embrace renewable energy and less environmentally destructive practices. Despite this, capital continues to pour into incredibly environmentally destructive projects, with muted democratic oversight. Our governments are filled with politicians who need corporate support to run their election campaigns, so their power is shared with the corporations who get them in. It’s a kind of bastardised democracy that many of the protesters believe can improved upon with greater citizen participation… An example of such participation might be citizens’ juries. This world, and this country, are facing real challenges, and these citizens are wanting to tackle many of them head-on. So, what does success look like to these people? 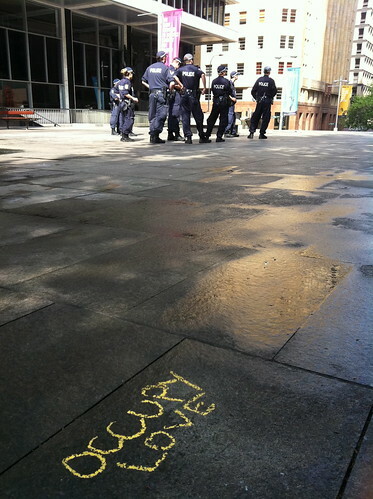 Well, in chalk on the footpath I saw a note: it read, “Change the system before the system changes you!”. 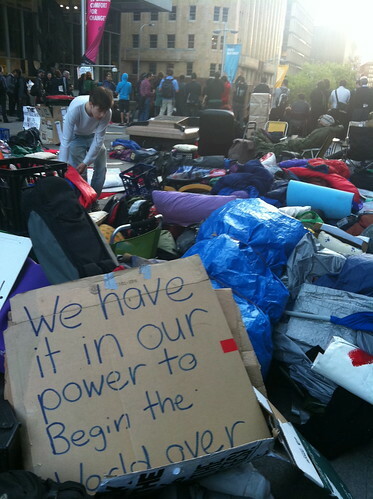 To what degree will the #occupy movement be able to gather the momentum and judgement needed to ‘change the system’? Only time will tell. Your passions – the stuff that gets you enthusiastic – the things you’re interested in… These are your best bits. Too many of us spend too much of our lives with our best bits wrapped up by the daily grind of the what we do. In this 18 minute talk, Simon Sinek is convinced that if we put our best bits out the front where they belong, people will want more. “Sell to people who believe what you believe – hire people who believe what you believe” is the mantra of Simon, the “Start with why” guy. If you’re interested in engaging family, friends, colleagues or customers with what you do, then grab your best bits and watch this. Few people have had as powerful an influence on my life as futurist and educator, Jan Lee Martin. It is with a heavy heart that I write this, because last night, Jan passed away. For nearly 20 years she ran her own public relations consultancy in Sydney, working with senior executives of government, private and not-for-profit organizations to improve their internal and external communication with stakeholders. It was when she sold that consultancy, and began to explore the boundaries of change, that she met the field of future studies. In the mid-90s she and some of Australia’s leading futurists established the Futures Foundation as an independent centre for learning about the future. Seven years later, the Foundation merged with the Future of Work Foundation, and Jan was able to hand over the chair and concentrate on other activities. For some years she continued to edit Future News and contribute to the website, and she still works on special projects with colleagues in the futuring community. She is a regular speaker at conferences in Australia and elsewhere; has worked as a senior executive coach for a major bank; occasionally writes for media; and maintains her family and community interests in Sydney and at Pearl Beach on the Central Coast of New South Wales. She has a special interest in changing ideas of what we mean by success; in changes in the way we measure performance (and success); and in the changing relationships between organizations and others in their host communities. Jan Lee Martin is co-chair of the Millennium Project in Australia (a WFUNA organization), a professional member of the World Future Society and a member of the World Futures Studies Federation. She has contributed to many publications including the Australia and New Zealand Public Relations Manual, the standard text in communication degree courses; and The Knowledge Base of Futures Studies, the standard text in futures studies degree courses. She is a member of the editorial board of the international Journal of Futures Studies and is listed in the World Future Society’s Directory of people who write and speak about the future. Jan Lee Martin is co-chair of the Millennium Project in Australia, a professional member of the World Future Society and a member of the World Futures Studies Federation. No biography can ever capture a person’s essence, and this is especially true of Jan… She was so deeply committed to understanding our world and helping make it better. It was that spirit that I found so inspiring. For 30 years Jan Lee Martin and Peter Lazar have been a dynamic duo – two communication professionals who, having established successful public relations practices, became powerful advocates of the application of foresight and futures studies… Playing leadership roles in the establishment of a futurist community in Australia. A decade ago, Jan and Peter came and spoke to Communication students at Charles Sturt University in Bathurst. I was in the audience, and their presentations, at the intersection of communication and futures were life changing. For me, I went from believing that I would be a communication professional (working in organisational communication), to discovering a new possibility – helping organisations grow in all facets by collaborating with them in pursuing inspiring futures. Initially, the audience (mostly men) were openly hostile to the concept of a “futurist” presenting to them. One of Jan’s opening slides was an illustration of a teddy bear who sat rather pensively in the corner of the frame, confessing that the more the bear learns, the more the bear realises how much there is to learn! A disarming slide, filled with humility – not a quality a large accounting firm had seen much of in the boardroom, I’d imagine! As Jan introduced the audience expertly to her perspectives, the participants began to come around. The presentation was a wonderful balance of science and sociology, of modern thinking and ancient wisdom. Models and ideas that are – ridiculously – still not embraced by corporate Australia were introduced in such plain English and in such a compelling manner… Jan’s sense of purpose was obvious, the positive nature of her intentions was clear. She was – as ever – so grounded and so generous. She told the story of the professor with the glass vase… The vase has room for rocks, pebbles and sand… But only if we start by putting the rocks in first… Jan recommended us all to fill our “vases” first with the ‘big rocks’ of family and friends. By now the audience were in… Now leaning forward, Jan shared with us a quote of her own, something she had penned back in 1988… ““Like any living system, including you and me, an organisation depends upon successful relationships if it is to survive and prosper.”. This pearl of wisdom is perfect for Jan, as it combines those two fields she brought together, communication and futures. Professionally, this is a very sad time for the foresight and futures community; a movement that is still young, but a movement that Jan played such an important role in sparking and amplifying in Australia. Jan Lee Martin brought her professionalism, diplomacy and generosity to a practice that needed a credible, passionate advocate. Her passing is a great loss to our community. Jan’s commitment to identify “inspiring ways to create the future” lives on in the lives of the many people she touched through her lifetime, not the least of which is mine. Love creativity? This is a great example of creative advertising. Burger King in the US set up their own “Whopper” interactive TV channel where you are paid in burgers to sit and watch a whopper. The longer you watch, the more free burgers you get. (5 minutes = 1 whopper). Anyone who’s seen The Meatrix (highly recommended) will know why I avoid fast food burgers altogether, but it’s still clever marketing. To see this TV channel in action, here’s a guy trying to get a free burger (offensive language warning) skip to 2min20sec to see how the channel can tell if you’re still paying attention. The audience for this unique campaign isn’t just people who watch Direct TV channel 111, but the various audiences that will extend the campaign through social media and word of mouth. Definitely an example for anyone looking for clues about the future of advertising & marketing… If you’re going to be boring with a standard old ‘product as hero’ shot… Do it in a creative and entertaining way!